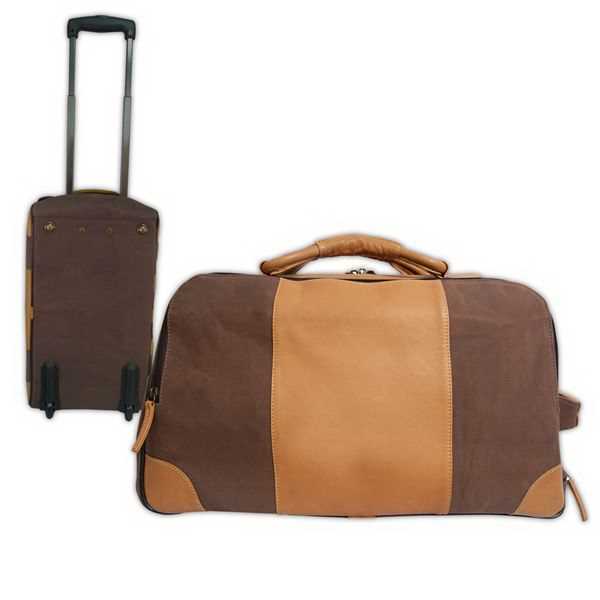 Get your brand on the road with this Stilson Canyon leather rolling duffel! This legal sized carry-on measures 11.00" x 11.00" x 20.00" and features two in-line skate wheels and a telescoping handle. The handle position can extend to 12" or 19". The large main compartment has an inside pocket for small items and large outside pocket. Polydrill lining keeps things neat. The ergonomic comfort shoulder strap adjusts from 36" to 50" for the perfect carrying length or it can detach. The bag can be carried with the padded soft handles as well. It's a great way to spread the word about your brand!